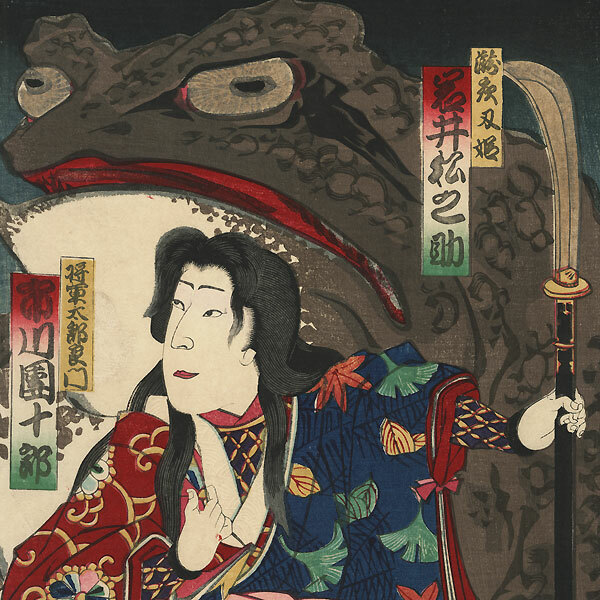 Comments - Terrific kabuki scene of a woman warrior and magician standing before an enormous magic toad, watching as the young samurai next to her raises his sword above his head with both hands, glaring at the noblemen at left. 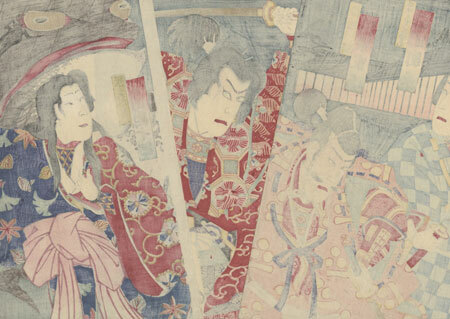 The beauty wears a blue kimono patterned with leaves caught in a spider web over a red floral print robe and a suit of armor, her long hair falling loosely over her shoulders. The young samurai's hair is pulled back into a thick ponytail tied with a white cord, and he also wears kimono and pants over armor. In the background at left, warm light glows in the shoji windows of a mansion beneath the night sky. A great, bold design with beautiful vibrant color, nicely detailed with embossing on the beauty's white kimono collar, burnishing on the young samurai's black kimono and the nobleman's black court cap, and dusting of mica along the top of the sky. 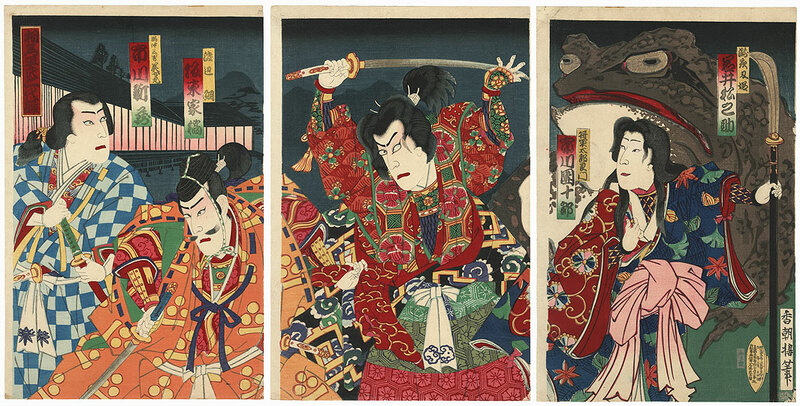 The blades of the sword and naginata, and the eyes of the toad feature metallic pigment that has oxidized to a dark tone. A fantastic supernatural image. Condition - This print with excellent color and detail as shown. Three separate panels. A few small wormholes and holes, repaired. Slight toning and soiling, a few creases. Please see photos for details. Good overall.